Dehumidifiers can overheat and catch fire. Do you have one? There are millions of dehumidifiers in homes across the country. A dehumidifier takes the moisture out of the air and keeps our homes dry. They work extremely hard in spring and summer. While your dehumidifier is certainly beneficial, it may be a fire danger! Have you heard of the massive recall of many brand name dehumidifiers? If not keep reading. 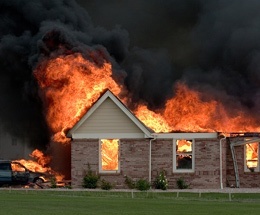 This article could prevent a dangerous fire in your home. At that time, Gree acknowledged a few dozen fires with an estimated $2.7 million in damage. On January 30, 2014 Gree expanded the recall to include General Electric (GE). The lastest recall which was issued on November 29, 2016, added even more popular brand names to the list. All of the recalled dehumidifiers were manufactured in China. West Bend has had several fire claims caused by the defective dehumidifiers. Damages total more than $1 million. Overall numbers throughout the country are on the rise and they're staggering. The U.S. Consumer Product Safety Commission has recalled 5.6 million dehumidifiers in two separate recalls. The dehumidifiers recalled have caused hundreds of fires resulting in $19 million in reported damage. The recall affects 60 different brands of dehumidifiers that were built between 2003 and 2013. The recalled dehumidifiers were sold at big box retailers such as Home Depot, Menards, Lowes, Walmart, Sam’s Club, Sears, K Mart, Lowes, HH Gregg, and even Amazon. To see if your dehumidifier is recalled, click here. The information provided will show you where to find the model number on your dehumidifier. Once you have the brand and model number, you can enter the information and do an online search. If your dehumidifier is on the list, stop using it and unplug it immediately. The recalled dehumidifiers can overheat, smoke, and catch fire. To watch some media coverage on this very dangerous and serious issue, check out the links below. Spring is here and you may be in the market for a new dehumidifier. If so, check out the Dehumidifier Buying Guide from Consumer Reports. Please share this information with your family and friends. It could save their lives! Do you have any information you’d like to share? I’d love to hear from you. Please share them in the comment box below.